Did you know Target gives you a 5c discount for every reusable bag you bring in on your shopping trip? I am going to save millions this year! Does anyone (in driving distance) want to read this book? It is not my type of story but it is a nice heartwarming book. My MIL left it here for me to read so it is time to pass it along. I want to play games with my kids all day and enjoy having Christmas behind us. On the agenda, Farkle, Fancy Nancy Puzzle, Legos, Picturika and of course some Wii. I am thinking I need to take them down in a little Mario Kart racing. I can't wait for Monday! The rugrats will be back in school! I love schedules and routines. I do not function well with no plan. I am also looking forward to having them out of the house because I am tired of cleaning. I have vacuumed, mopped and/or swept every day since they went on break. I had forgotten how many crumbs these guys leave behind all day long! I also can't wait to go back to the gym. My kids hate the child care there so I am locked out until they are back in school. 2 days and counting! 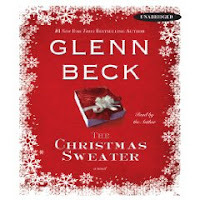 I would love to borrow The Christmas Sweater....it was recommended (by my Mormon blog friends). I guess it was written by a guy who converted to Mormonism...looked like a heartwarming story but I didn't want to pay to buy it...lol. Loved Bedtime Stories....and we also rented Step Brothers...we laughed a lot at first and than it was like "wowzers with the F-bombs for sure"..and than by the end we were like "just end already!!" And Ashley got the Mamma Mia soundtrack for Christmas...and she listens to it A LOT....I think it is so cute that she sings ABBA, Brandon not so much. :) And AMEN for back on schedules! I always enjoy your random thoughts. Good tip on the Target bags! Looking forward to your New Year's pics. I always love reading your blogs....but I am never a good commenter. I feel like there is lots of stress to say the most clever or wittiest thing. So, I just thought you should know that i like to read it!